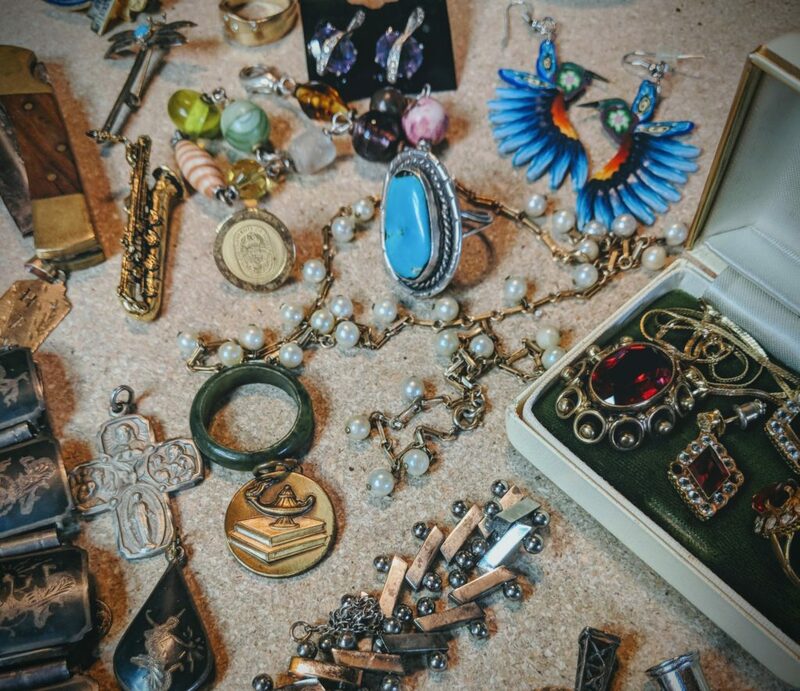 My grandma and I sat together on the daybed in my grandparents’ guest bedroom and looked at the jewelry she kept in boxes, which were stuffed in black, heavy-duty 50-gallon trash bags under the bed to disguise its value during a potential robbery. She was telling me stories and passing some of it into my possession- none of the high-value items, though, she said. The ‘nice’ stuff was already claimed by my aunts and other family members. I didn’t care, and she knew it. She handed me a delicate pearl necklace and bracelet set and told me she bought it with her first paycheck. There are two pearls missing from the necklace and four from the bracelet. There is a clumsy, out-of-place jump ring on the bracelet. The set is pretty and too small for me, but it is warm to the eye and to the touch, and when I take it out of its pouch I feel closer to my grandma and remember her stories. I recently spent ten days in Ohio, with family. My sister had a baby in August- the first baby among my siblings! He was five weeks old, and kicked his little legs and arms non-stop, like a swimmer. Babies and animals inspire me to improvise ridiculous songs, and I sing them badly, but babies and animals don’t care about bad singing; so I sang songs to him about ceiling fans and bubbly bellies, and his uncle Brian quietly mumbled nonsense stories in his grumbly voice to baby Leo. He reminds me so much of my sister, who was born when I was six- his little nose, and circumspect pouts and grimaces. My grandma gave me more of her jewelry then, but we didn’t have time for these stories. My grandpa tells stories, too, almost non-stop. We’ve all heard the same story cycles over and over through the years, but lately some of the details have changed, usually exaggerated, probably to more closely match the emotions he feels about the memories. He’s in his nineties, and his grasp on time and space is a little loose sometimes. Even so, every new version of his old memories is now its own memory for the listener. Now that I’ve sorted the jumble of rings, bracelets, and pendants my grandma handed to me in Ohio, all I want to know is where they came from and what they mean or meant to her. I want her to know how important it is to me to be able to keep her stories and share them with others. An idea for a photo book of her jewelry and the memories for each piece forms in my mind. I get lost in the details of each piece, thinking about the hands that made it, how it was made, where it came from, the spots worn thin and missing parts. I think about the stories. Arte Soleil is a place full of stories, from the beautiful people investing time and love into their community, to the art and hand-crafted items in the shop. Stories are born naturally out of hand-made and thoughtfully crafted things, and when you pass them on to loved-ones, be sure to pass on the little part of your story that is in it, too! That was lovely to read. It made me think of my grandmothers and their stories. Thank you.